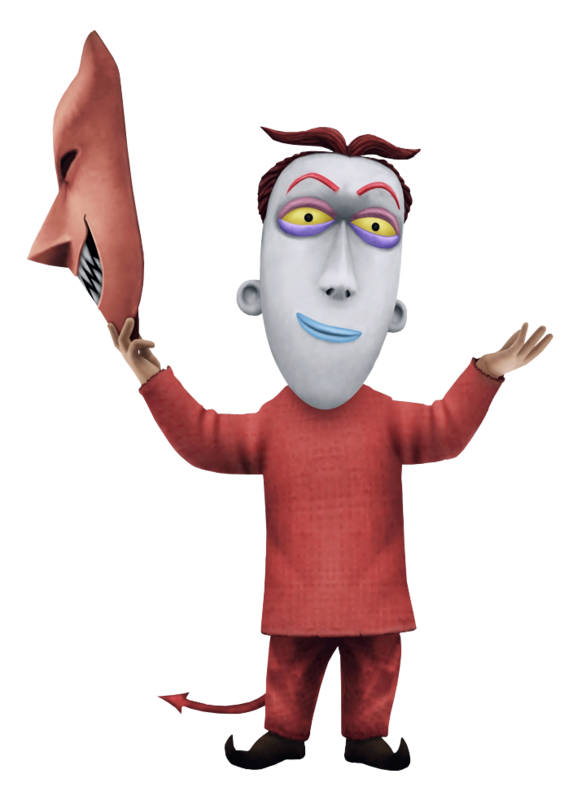 Lock serves as the leader of Halloween Town's infamous trio of miscreants, decked out in a bright red devil costume, complete with a mask to hide his pale face and eyes lit up with a fire that feeds off of pure, undiluted mischief. When they're not pulling pranks on the townsfolk, he, Shock and Barrel act as Oogie Boogie's eyes and ears, informing him of the who, what, where, when, why and how with everyone and everything that's going around in town. He and his cohorts overhear Jack telling Sally about the heart he's making, and go off to tell Oogie about this new revelation. They steal the heart from the laboratory, and after delivering it to him, initiate a battle in their playroom against the party to prevent them from proceeding further. A third of the trio of child miscreants, Lock is the leader of his pack of three. His attitude is as devilish as the clothes that adorn his body, not to speak of the devil mask he slaps on his face. It is often Lock who comes up with cunning ideas for trouble. Lock along with his two playmates Shock and Barrel spends his days in Dr. Finkelstein's laboratory where said doctor is building him and his friends a plaything, later known as The Experiment. Lock and friends are later hired by Maleficent to cause a ruckus in Christmas Town; once this fails and once Maleficent resurrects their evil master Oogie Boogie from the dead, Lock and his pals are given dominion over a cage Heartless whose element changes according to the person inside its cage. In this case, Lock symbolizes fire. Unfortunately for Lock, this will be the last of his fun for a while and so he and his peers sift through Santa's toys for parts for their would-be plaything. Fun comes along again soon as Sora and friends accuse them of stealing presents - of which they are innocent - but alas, they are whipped back into shape and Lock runs away with his tail between his little legs. The ringleader of a mischievous trio of pranksters, Lock, like his devil suit implies, is rotten to the core, more interested in annoying others than actually contributing to the Halloween celebrations. His latest scheme is to create a Heartless which eats its own kind, a plan which he attempts to hide from Roxas by distracting him with pumpkin bombs. Although the Parasite Grave is defeated, Lock will continue to look for other ways to satisfy his craving for causing chaos.